With warm weather every month of the year, South Florida offers an ideal climate for cycling enthusiasts. However, the tri-county area also is home to some of the nation's very worst motor vehicle drivers, and that amalgam can result in crippling, life-altering injuries for innocent cyclists. We have all seen in the media incidents of cyclists being struck by careless drivers. It is all too common in Broward County, Miami-Dade County, and Palm Beach County, to read a newspaper report or watch on the evening newscast a story about a cyclist who was sideswiped, rear-ended, or flat-out slammed into by an automobile. When lucky, these cyclists will sustain only minor injuries. On occasion, such as when Carlos Bertonatti got drunk at a downtown Miami nightclub called Space, then got into his car and struck cyclist Christophe LeCanne on the Rickenbacker Causeway in January, 2010, death is the end-result. Another cyclist named Aaron Cohen lost his life on that very same route a little more than two years later when a car slammed into him, an accident from which the driver ultimately left the scene before police arrived. Michele Traverso was eventually arrested and sentenced to one year in prison for his role in the incident. Despite relentless calls for better safety provisions for cyclists, accidents throughout South Florida continue to occur. And an increasing number of local residents are taking to the streets on bike, both as a means of saving money in the wake of the ever-increasing cost of fuel -- and as a means of living a green lifestyle. If you have been injured because of the negligence of a motor vehicle driver while riding your bicycle on the streets of South Florida, we encourage you to call The Law Offices of Brumer & Brumer to find out if a monetary award is possible. For more than five decades, the attorneys at Brumer & Brumer, one of the Top Personal Injury Law Firms in all of South Florida, has been holding accountable careless, negligent, and irresponsible parties responsible for injuries and death to our clients. 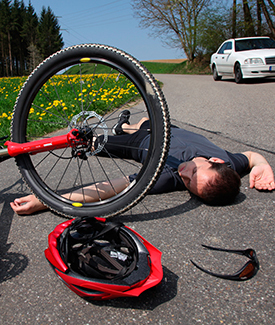 Instances of cyclists incurring injuries on the roadways of South Florida are serious matters that require a serious law firm with the requisite knowledge and competence to effect change. According to findings by the Florida Department of Highway Safety, there were an even dozen cyclists who were killed by motor vehicle drivers throughout the Sunshine State in 2009. One year earlier, there were only seven. Until government officials in South Florida green-light creation of an adequate number of bike lanes on public roads -- and toughen the penalties against drivers who recklessly slam into cyclists -- the problem is only going to worsen. If you have lost wages, have experienced pain and suffering, or have been unable to fully enjoy the sport of cycling because of a bicycle accident in which you were involved, the personal injury lawyers at Brumer & Brumer would welcome the opportunity to help you receive a monetary award from the guilty party.